When one speaks of bakeries it is places like Goa, Bangalore, Pondicherry… which come to mind. Delhi on the other hand has always been a Mughal bastion with insatiable appetite for Mughalai food followed by evergreen Punjabi cuisine. Bakeries in this Mughal area seem far fetched, till I finally made a trip to Chandni Chowk to sample the goodies. Technically not Chandni Chowk but a tiny area called Chitli Qabar within it. The place is accessible by a turn next to the Golcha cinema on Darya Ganj. A rickshaw is the best bet to get to Chitli Qabar chowk. The path opens out at the other end near Gate Number 1 of Jama Masjid. The market is called Matia Mahal market. Despite the tiny bylanes, jostling crowds there is a certain genteel pace to the place, burkha clad women chip in promptly with suggestions and tips including what to savour, seeking directions is met with an avuncular reply akin to giving directions in a village. There are no count to the bakeries and as one proceeds into the bylanes more bakeries pop up. One of the most famous of bakeries is Diamond Bakery which has been around for over 100 years, while Asgar Bakery 70 odd years. Rusk Paya is one of the most popular rusk made.. The making of rusk paya is a process in itself taking almost 24 hours on wood fired ovens. It is made of suji or rava and special ingredients. It is interesting to see the workers carefully line the plates of paya with wood briquettes. The paya is first baked, cut and then baked again. So perfect it can safely last a few months. What makes the paya special is that instead of yeast a special masala made of 51 or so ingredient is added. The masala is made everyday, it works like yeast. Baking in the bakeries is done on wood fired ovens, diesel and electric ovens. The best month to visit is of course during Ramzan when everything that the shops make is on offer. During the other days a lot of these delicacies are not available. Almost all the shops offer rusks or Rusk paya, gol rusk, cake rusk, suji rusk, fruit rusk, Tabarak roti, Sheermaal, Nankathai… Md. Anis explains Tabarak roti and its link with the religious routine from Ajmer adding, it is distributed at the Dargahs just like halwa is distributed during religious fasts. What is made for distribution is a larger sized version of what is available everyday. The daily Tabarak roti is round almost like the roti or chappatis, 4 inches in diameter. It is made from rava has a very slight sweet taste to it, not really overpowering. It is the addition of saunf or fennel seeds which gives it a unique crisp flavour. It is an ideal accompaniment to a cup of coffee or tea, not too sweet but tasty and filling. Sheermaal, bun like is made everyday. During Ramzan out comes the butter jam sheermaal, there is dry fruits sheermaal, cherry sheermaal, sheermaal parantha. Aqil says, “we have about 30 – 35 items. All of which are made during the month of Ramzan. Dil Khush and Coconut Paranthas are our special items. No one makes them here. Otherwise the rest are regular fare which every bakery makes.” Regular or not it is mouth watering and tempting to say the least. Do visit and enjoy yourself in the wonderful world of baked products. Most exhibitions are private affairs. Huge trade shows have not been successful despite great effort. In the private shows it is the designers like Poonam Soni, Aparna Gujral, Asha Kamal Modi, Art Karat who thrive. MMTC (Mines & Minerals Trading Corporation), a large Public Sector Enterprise organizes its consumer / retail exhibition, a real treat during Diwali (the Indian festival of Lights when the Goddess of Wealth – Lakshmi is worshipped, occurs in October - November depending on the Hindu calender). The best selling period is the Wedding and Diwali. The tradition of Diwali has Dhanteras when jewelry is bought. One of the stories surrounding Dhanteras is that it is on this day that the proverbial nectar was churned from the ocean and Dhanwantri (the physician of Gods) emerged carrying nectar. Hence this day is dedicated to worshipping Goddess Lakshmi. It is customary to buy new utensils or precious metals. Thus most shops are choc a block during this period. Otherwise most jewelry manufacturers organize in-house exhibition for their clientele in the showrooms itself. Other places for exhibitions are usually five star hotels where it is possible to install high security gadgets for surveillance. Dedicated exhibition halls are yet to take off in a big way. The Export Promotion Parks in neighboring Noida has some well known Export Oriented Units. 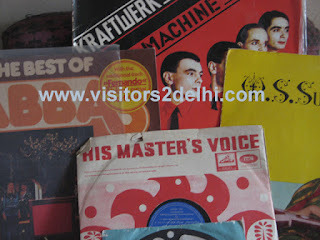 The Crafts Museum, Delhi also affords for craftsmen from across the country to come and sell their wares in Delhi. Most come and demonstrate their crafts as well. These include Thewa, craftsmen specializing in tribal jewelry in gold and silver from Jharkhand and Chattisgarh. Near Delhi, Jaipur is a jewelry makers and collector’s paradise. Some of the finest of craftsmen can be found there. It is also well known for its stone work – cutting, polishing, jade engraving and more. Other well known centres include: Meerut is a well known centre. It has a concentration of more than 50,000 craftsmen. Amritsar (447 kms), Ambala (192 kms from Delhi) are other areas. Benares or Varanasi (780 kms from Delhi) the holy city is known for its silversmithing and silver jewelry. ophone – yes the logo of HMV – His Master’s Voice. The old HMV was replaced by HMV’s 1010 stereo, the romance continued but alas the stereo stopped working. The speed wheel fell out of favour. With the company not manufacturing record players, spare parts were not available. Well, the stereo and the wonderful collection of records remained carefully kept. The search for a repairer unearthed plenty but one was loathe to part with the system for fear that it might be ruined for ever. Then Ravi Kant Sharma happened. The repair of the record player seemed fated as I discovered his shop pretty close by. Ravi Kant, runs this shop in Alaknanda’s mini market. The shop is a small cub hole with a small basement and an attic. What though stands out is his absolute love for electronic products – the older the better. And an absolute obstinacy to let go of any electronic item unrepaired. As he says, “jo dukhan mein atti hai woh yahan se teekh hoke jaati hai.” There is this maniacal fixation to hunt spare parts. 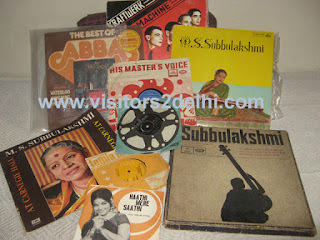 His repertoire extends to tape recorders, TVs, Smart TVs, VCRs, VCPs, music system…. The shop is crammed with LCDs, VCRs, stereos, music systems, CD players.. His midas touch in repairing two of my walkmans and a 2in1 prompted me to query about his repairing the 1010 stereo. He readily agreed. The set was transported to his shop and it lay there. Over a year, I would faithfully visit, see the stereo be happy that it was safe and come back. He was unable to get the Edler’s wheel. A search on the net then revealed spare part dealers in Chandni Chowk and Jama Masjid. I gave the numbers. What materialized after literally months of chasing was well, M S Subbulakshmi singing redolently early in the morning. Our collection records have suddenly been revitalized and some wonderful wafts in the morning. It does take time to get used to records, their varying speeds, the means of playing it on either sides. There is no automatic streaming. It is manual and of a slow laid back era. The repair has been well worth its wait. The speakers were galvanized and lo we were back in action. He can even add USB ports to older systems. He can offer connections by which yes I am able to play music from my smartphone on to the old speakers of our 1010 stereo! Strange!! The man is old fashioned, believes in quality work and does not hurry. Go to him with some time, sit and chat. He believes in building relationships. Yes, even for taking money due to him. It is an old fashioned place, still untouched by greed, chalu kaam and shoddy workmanship. The work is well worth the time. 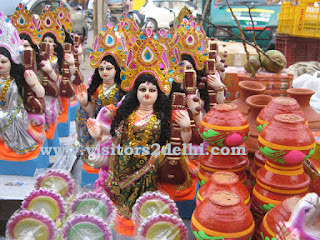 The Bengali bastion of Chittaranjan Park comes alive for Basant Panchami with beautiful Saraswati Dolls of all sizes. Kul, kanthali kola, jackfruits, drumstick flowers, shank alu and more… Basant Panchami marks the coming of the Basant Ritu and is celebrated across India. At one point of time people used to herald it by wearing yellow clothes. In Bengal it also marks the day for Saraswati Puja. The C R Park Market II, my favourite haunt for the unusual is packed with a whole lot of traditional items. After getting the dates correct through Anindo Banerjee ex ABP with whom I have worked a lot, I trudge to C R Park Market I to pick up Nalen gur (khajur or palm gur) and shoot the buzzing market stocked with traditional “Puja” item, only to be told to come the next day when the market would be full. And it is full. There are batashas made of nalen gur, til ladoos, aam papads, drumstick flowers. Yes, drumstick flowers, I am told it is used to make delicious pakoras. There is nalen gur in abundance as also the syrup. What though stands out is the serene idols of Ma Saraswati, pristine in white with a calm expression, holding her veena perched on a swan. In true artistic style each protima is beautifully made and decked in clothes and jewellery. Kul traditional ber nice ripe red, there is delicious tiny bananas called kanthali kola similar to the ones got in Bangalore and Virupakshi from Pollachi. Green coconut with stalks, ink pot and pen (quills from bamboo). The vegetable selection is nice and fresh, straight from Kolkata I am told. 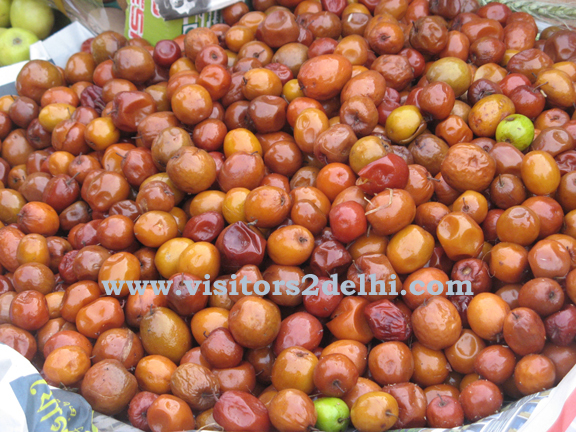 There are small jackfruits, small cute petas, wonderful green aubergines or brinjals, small karelas or bitter gourd, the range of poi shaak. The camera goes clicking furiously. Shopkeepers smile indulgently. 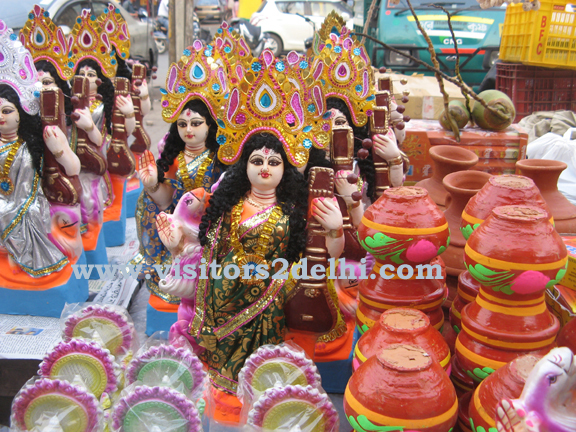 There are decorations made from sholapith, the host of puja saman. The alu I am told is eaten raw with addition of salt. The Puja happens in quite a few places in C R Park. The Shiv Mandir puja and that at Raisina School in the morning till afternoon is blissfully divine. Saraswati puja is when students, artists pray for her Divine blessings in the pursuit of knowledge. I do so by offering Nalen gur payash!